484 pages | 69 B/W Illus. Used to train generations of social scientists, this thoroughly updated classic text covers the latest research techniques and designs. Applauded for its comprehensive coverage, the breadth and depth of content is unparalleled. Through a multi-methodology approach, the text guides readers toward the design and conduct of social research from the ground up. Explained with applied examples useful to the social, behavioral, educational, and organizational sciences, the methods described are intended to be relevant to contemporary researchers. -Emphasis on understanding the principles that govern the use of a method to facilitate the researcher’s choice of the best technique for a given situation. - Use of the laboratory experiment as a touchstone to describe and evaluate field experiments, correlational designs, quasi experiments, evaluation studies, and survey designs. -Coverage of the ethics of social research including the power a researcher wields and tips on how to use it responsibly. -A new co-author, Andrew Lac, instrumental in fine tuning the book’s accessible approach and highlighting the most recent developments at the intersection of design and statistics. -More learning tools including more explanation of the basic concepts, more research examples, tables, and figures, and the addition of bold faced terms, chapter conclusions, discussion questions, and a glossary. -Extensive revision of chapter (3) on measurement reliability theory that examines test theory, latent factors, factor analysis, and item response theory. -Expanded coverage of cutting-edge methodologies including mediation and moderation, reliability and validity, missing data, and more physiological approaches such as neuroimaging and fMRIs. -A new web based resource package that features Power Points and discussion and exam questions for each chapter and for students chapter outlines and summaries, key terms, and suggested readings. 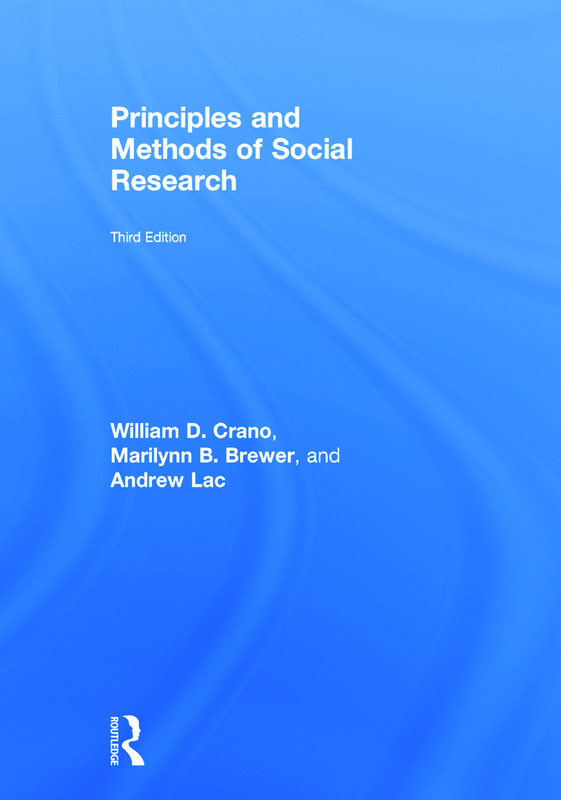 Intended as a text for graduate or advanced undergraduate courses in research methods (design) in psychology, communication, sociology, education, public health, and marketing, an introductory undergraduate course on research methods is recommended. William D. Crano is the Oskamp Distinguished Chair and Head of the Department of Psychology at Claremont Graduate University. Marilynn B. Brewer is Professor Emeritus from the Ohio State University and a Visiting Professor of Psychology at the University of New South Wales. Andrew Lac is Research Professor of Psychology at Claremont Graduate University.